My work is predominantly driven by critical inquiry of modern American cultural phenomena and its conversation with economics. I am curious how current realities of American culture relate to our visual history. The way I draw often reflects formal, structural, and stylistic qualities of paintings and drawings that were made during the beginning of the republic, the early 19th century, a time in which excitement for the new country led to many citizens eagerly attempting to document its inception through painting. Looking at current American realities and identities I have experienced, my work uses the aesthetics of the vernacular in which I exist to describe ideas surrounding leisure, themes, race, and recreation. My work is an investigation into the status of images and the effect that technological innovation has had on our perception of the visual. Using traditional and digital reprographics, sculptural props, painting, drawing and text, I addresses the dichotomy between the idea that a machine’s function is to reveal or produce, and conversely its inevitable constructive force to create whoozy, broken, illogical or ‘wrong’ representations of reality. Viewing tools and machines as creatures with pronounced vestigial features, I highlight a parasitical dependency between forms of imagery and reproduction, ornamental deceit and the conditions of spectatorship. I keep on exploring new possibilities responding to all sorts of problems. “What ifs” are obsessing me so often I am constantly starting from scratch, quickly jumping from one idea to another. The things I make are always triggered by a new impulse erasing the last. However, even though this will never make me a specialist, it gives an opportunity for anything to enter my field of interest. During 2012 I walked over 3,500 kilometres with the aim of creating a body of work which would explore the idea of long-distance walking as a form of meditation and personal transformation. My intention was to create a series of quiet, meditative images, which would evoke the experience of being immersed in nature and capture the essence of the journey. The images seek to engage the viewer in this walk, and to communicate a sense of the subtle internal and psychological changes which one may undergo while negotiating the landscape. ￼The moments and feelings that are filtered and collected in my life have created a strange combination. They are expressed as ordinary objects or situations created by people in the painted images. At the same time, the unreal combinations from the collision of different objects become a narrative that represents a reality. There is almost no serial piece in the body of work. All my works represent different yet identical threads/connections because they are initiated from the countless questions of what to paint. However, they can be described as a depiction of various attitudes conveying the ‘present’ at all times. Images above top left from the installation You Cannot Eat an Image and an Image Cannot Eat You by Joey Bryniarska, top centre Bam! 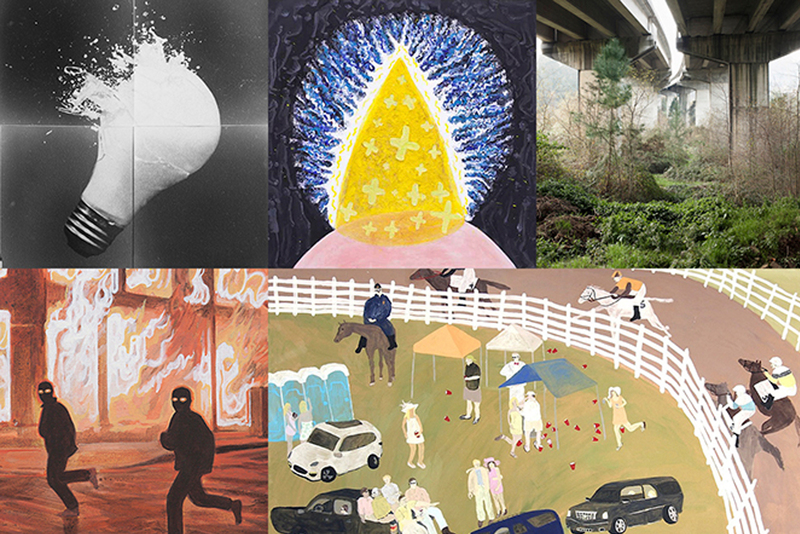 by Mathilde Ganancia, top right Untitled from the series We Make the Path by Walking by Paul Gaffney, bottom left Run Away by Woosung Lee and bottom right Steeple Chase by Emma Schwartz.